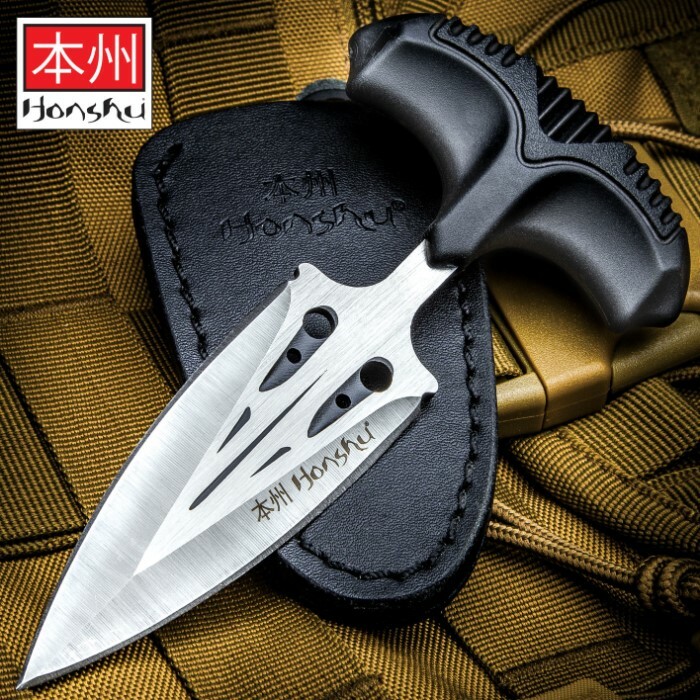 Honshu Large Covert Defense Push Dagger And Sheath - 7Cr13 Stainless Steel Blade, Molded TPR Handle - Length 5 7/8” | BUDK.com - Knives & Swords At The Lowest Prices! Ideal for covert personal protection, the Honshu Large Covert Defense Push Dagger is that extra measure of peace of mind that you’ve been looking for! The discreet self-defense dagger has a sharp 3 3/8” 7Cr13 stainless steel, satin finished blade with a deep pressed groove and through holes. The push handle is textured injection molded TPR rubber, which gives you the best possible grip. The blade slides into a genuine leather sheath that has a quick release snap and features a nickel-plated steel boot clip. 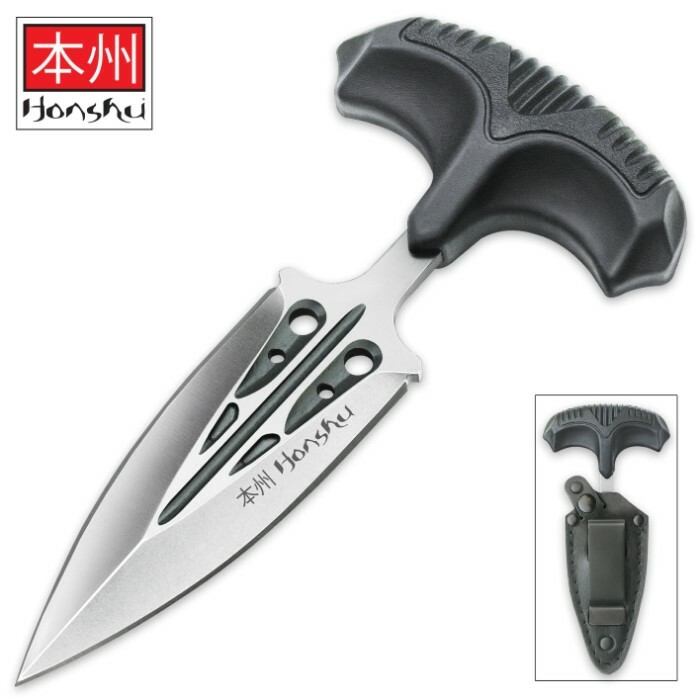 Let the Honshu Large Covert Defense Push Dagger back you up! It's near shaving sharp out of the box, and with enough practice, the quick release clip let's you get the snap button undone and the knife drawn lightning fast. Not to mention the rest of the sheath is great quality. It's very low profile as well. I actually forgot I had it on my belt for a second. The grip is a little uncomfortable, but it's not terrible. Overall, if you want something simple, yet effective for self defense, just buy this and you'll be perfectly fine. Just be careful, as if you straight up punch someone in the gut with this, they won't be walking away from the encounter. Even if they somehow do, they won't get far. Received this item and was pleased with the quality and design. 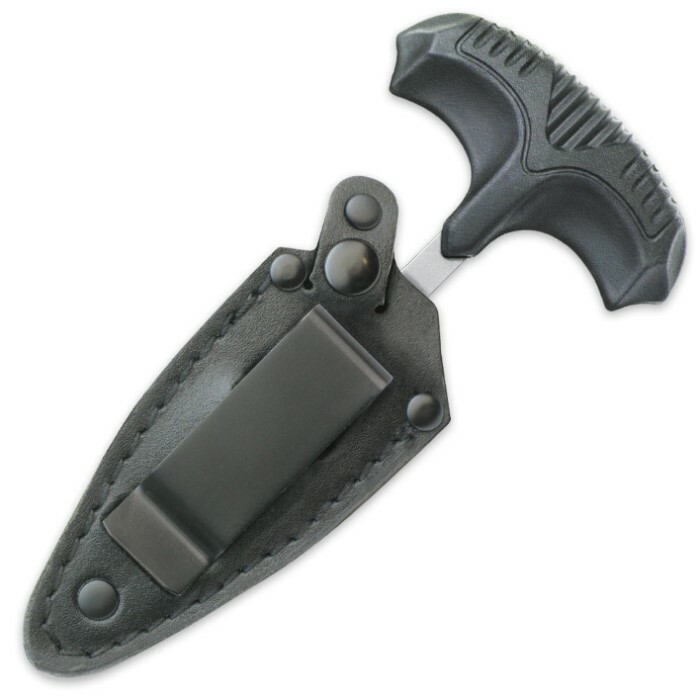 Overall size is nice and comes with standard quality sheath. Good packaging. Would recommend.